Soon after grabbing a coveted position in the House, longtime Texas Rep. Kevin Brady is facing a tough primary challenge from the far right that could shake up an influential congressional committee. Brady ascended to chairman of the powerful House Ways and Means Committee in November when Rep. Paul Ryan of Wisconsin became speaker of the House. 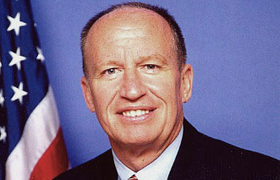 Brady was previously chairman of the subcommittee on health. The Ways and Means Committee handles tax legislation and oversees Social Security and Medicare. Brady was also recently named to the Task Force on Health Care Reform, which Ryan organized to develop a plan for replacing the Affordable Care Act. Brady, who has held his seat for 10 terms, hasn't had a real electoral challenge since his first time on the ballot in 1996. But he has conceded that this race could be trouble. Former Texas Rep. Steve Toth is the biggest concern in the election Tuesday. The other candidates are U.S. Army Lt. Col. Andre Dean and Craig McMichael, who lost to Brady in the 2014 primary. Toth served one term in the Texas House of Representatives before running for a state Senate seat in 2014. He came in second in the primary and lost in the runoff to a four-term state representative. In an “on the issues” section of his website, Toth lists “defund Obamacare” behind only the Second Amendment. The page also highlights immigration and abortion issues as well as elimination of some government agencies. Brady has raised about $1.8 million for his campaign, the most of any Texas candidate for the U.S. House this year. His war chest dwarfs his opponents, who are relying on a more grass-roots approach. The top industry to donate to Brady is the health industry. He was the No. 2 recipient from hospitals and nursing homes in 2015-16. The worry of Brady and his supporters brings to mind Majority Leader Eric Cantor's shocking primary loss in 2014, which led to growing Republican incumbent fear of being “primaried” by someone from the far right. Brandon Rottinghaus, political science professor at the University of Houston, said it is an issue playing out at all levels of the Republican Party and across the country. Incumbents are facing challengers who don't have to defend a voting record and constituents who are quick to turn on any politician they see as part of the establishment. But that attitude risks losing the institutional knowledge of incumbents and the time and effort they've spent trying to get to a leadership position that could allow them to make the changes they've campaigned on, Rottinghaus said. For Brady, however, campaigning on his chairmanship would most likely backfire by reinforcing the notion that he's a creature of Washington, Rottinghaus added. The district, centered in a suburban county north of Houston, is the “epi-center of the tea party” in that part of the state. It's quite likely that Brady will get the most votes Tuesday, but anything less than 50% will force a runoff on May 24 with the second-place candidate. Mark Jones, a fellow at Rice University's Baker Institute, said that voters who cast ballots in a runoff election are more conservative and the turnout would be lower than for the primary, both of which are bad for Brady. The election coincides with the Super Tuesday presidential primaries. Texas Sen. Ted Cruz leads in most of his home state's polls and is likely to perform well in the district, which is one of the most conservative in the country. Rottinghaus said voters turning out for Cruz or Donald Trump are likely to cast their vote for someone to the right of Brady. “They represent a voter that is dissatisfied with the status quo and wants change,” he said.